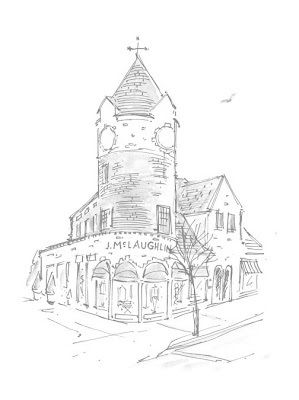 Do you have a favorite landmark building, or site that you love to go to, it could be a shop or a quaint spot to go to that might need a sketch. Take a look at this site with a new launch. Click around and see my illustrations sprinkled about. The bulk of those illustrations were done over many years as stores opened. I take great delight in knowing that my work has longevity and continues to smile on. My illustration and design services are available for commissions. 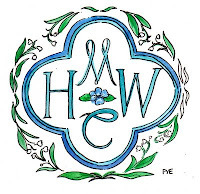 Let me know if you are a small business or a home in need of commemorating? Times may pose challenges, but we all need to look for happy smiling places. Nothing like a little shameless self promotion to spread a little cheer! It feels good to know that my work lives on. I love them even more today. I do have some favorite places here in madison, though my ultimate favorites are in Petoskey, MI and on Mackinac Island! I love these illustrations--so colorful and playful! Are you on the Nurse track?? I say~ Self Promote! 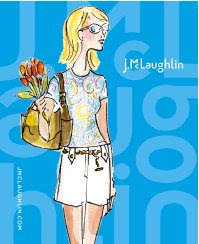 You have created whimsical, bright, cheery illustrations for McLaughlin. They are fortunate to have your delightful work. 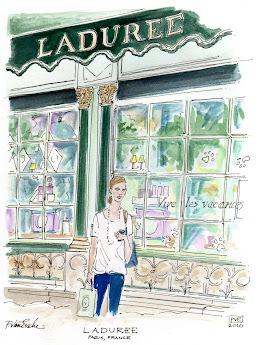 I would much rather see these charming illustrations than the day to day models- these gals radiate style. 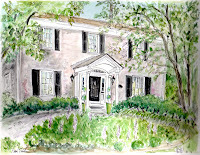 I think you painted the one in my town (Morristown, NJ). It's very cheery and uplifting to look at. I can see you looking smart and hair in pig-tails, smiling us along! off to e-mail you something now. Oh, I love that yellow door! I think that is so wonderful how timeless and beautiful your work is. That's talent! I love your work, and the little art work pieces all over their site are so great- it gives it something special! Swing by tomorow (or 3am-ish this am! )for a little more promotion...just a smidge. You know I love your J. McL work! I love your work and will most likely post some pictures soon. I started a second blog that's less writing than pictures - so probably there. You should promote your work...it's wonderful. Love those storefronts. Will watch for your red tomorrow. be sure and stop back tomorrow for a perfect beginning to motivate you to keep on truckin! Really and seriously... Good For YOU! Your renderings are just great. I'm with Debra -- I would much rather see your work than photos or anything else. These are charming! You do really lovely work. 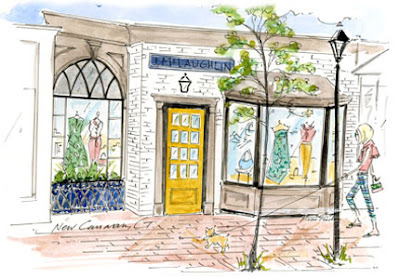 Your store fronts/shops are always my favorites.. wish I had a store to get an illustration from you of! Oh and what kind of store might you have, a bakery, a camera shop, a book store, a flat stanley store, a craft store, a happy store full of goodness....or a coffee shop where all the bloggers would go to. I know whatever shop you have, it would be a happy place and I would frequent it often! your work is always so exquisite and charming, patricia! 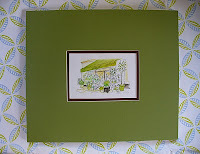 love the sunny day background in your shopfront prints. promote on! ps. thank you for the camp question! Looks great! I love the look and colors you use. You have a neat way of capturing that's like a little window into someone else's world. Thanks for sharing! If you got it, you gotta flaunt it! The Jefferson Memorial, hands down, off season, no tourists, just the quiet and the water. It was much better before the changes/restrix following Sept. 11th, but it still soothes the soul. And didn't J. McLaughlin do a grand job with the site overhaul? PS: We adore the self-promotion, one of our goals is to do well enough to request the honor of your services for our graphic look! I agree with Debra. Your designs just make me smile. 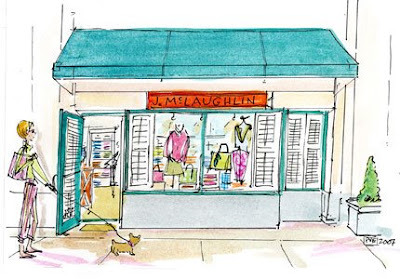 I LOVE J. McLaughlin and as soon as I saw the first illustration in this post I realized that I had seen your work at the one in Charleston, SC. I love these illustrations so much. has your work load lightened up at all?